From the honey-coloured limestone cottages of the Cotswolds, to the whitewashed crofts of the Scottish Highlands, British cottages offer beautiful expressions of vernacular architecture through the ages and are awash with original architectural features that deserve to be celebrated. Whether you have a traditional cottage that you're looking to renovate, or a more modern home that is crying out for some instant country cottage charm, use these ideas to help inspire a quintessential cottage scheme. Find out more about how to renovate a house of whatever period in our practical guide. Set the tone for snug nights in with a classic cast iron stove. While up to 90 per cent of the heat from an open fire can be lost up the chimney, a stove benefits from increased efficiency, radiating more heat throughout the room. With its curvaceous design inspired by the antique Howard models, this Alwinton sofa from Sofas & Stuff is both elegant and relaxed. Available in four-seater through to two-seater sizes, as well as a love seat option (great for those tight on space), it also comes in a range of fabrics, such as linens, wools, checks and tickings, to complement the rustic cottage look. Explore more of this charming Wiltshire thatched cottage, and find more sofas for small living rooms in our buying guide. For a timeless look, mix and match classic Shaker cabinetry with unique vintage stand alone units. Whether they’re family heirlooms or flea market finds, vintage wooden sideboards, tables, plate racks and cupboards have an inimitable character which perfectly complements the rustic features of a country cottage. Team with classic built-in units in classic cream and you’ll have a look which will stand the test of time. Check out how to design a vintage kitchen for more advice, and be inspired by our favourite Shaker kitchen design ideas. 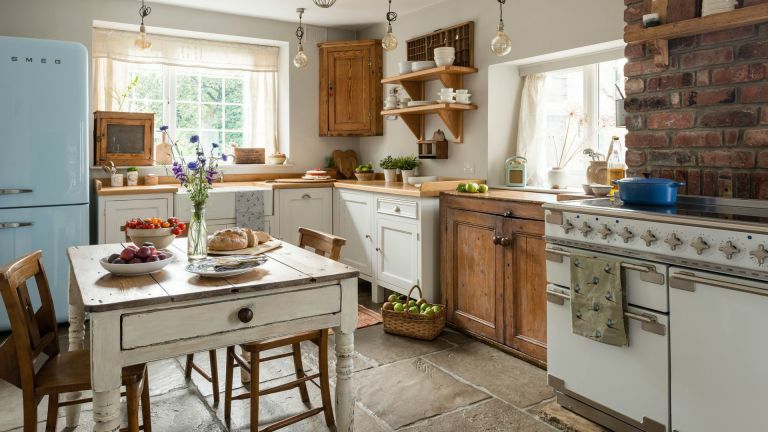 A classic range cooker has become an iconic feature of a cottage kitchen. Historically many rural cottages were served by heat storage range cookers such as Agas and Rayburns, that would have provided radiant heat for the entire house. Today there's a wide range of sizes, fuel types to choose from, as well as an infinite number of finishes and colours. For more information on buying a range cooker, see our guide. If you’re lucky enough to own a period home you’ll want to show off its unique character. Rather than plastering over original stone walls, or hiding original beams with faux ceilings, incorporate these features into your interior design. However, if doing this, be sure to add softness with textiles and furniture. With its upholstered headboard in uplifting yellow, the Laura Ashley Houghton bed really helps soften the rustic surfaces in this Welsh cottage bedroom. Find inspiration for your scheme with our favourite traditional bedroom design ideas. Nothing says English cottage style like a profusion of old-fashioned floral prints. For a really quaint country look try them on wallpapers, curtains and bedding. Laura Ashley, Sanderson and Clarke & Clarke will have have plenty of options, alternatively head to the flea markets to find original designs you can't find in the shops for a unique vintage look. Tour this traditional cottage for more decorating ideas. When you have beams as beautiful as these in your bathroom, you’re bound to want to spend hours soaking in the bath admiring them. A period home must-have, a roll top bath will really enhance the traditional feel. Salvaged originals are available from reclamation yards, along with new traditional cast iron models. However there are also lighter and more affordable fibreglass alternatives on the market, all with a range of finishes as well as feet and plinth options. If you’re thinking of installing a roll top bath in a cottage then be sure to check that your floor doesn’t need reinforcing, as older properties may not be able to support the weight, particularly if it's a cast iron model. For more inspiration see these 11 freestanding baths for traditional homes. Tongue and groove panelling is a brilliant way to capture the country cottage look, especially when painted in a classic green/blue or dug egg shade. For custom panelling try The English Panelling Company. For more inspiration and advice, head to our panelling design gallery. Whether single stems in bud vases of a beautiful bouquet of English garden favourites, fresh flowers are the perfect finishing touch to bring the cottage look to life. A bunch, plucked from the nearest meadow would be lovely, but who has time for that when the likes of Bloom & Wild can do it for you, and deliver straight to your door! But if you do have time... find out how to grow your own cutting garden in our guide. A key component of a cottage facade, front doors contribute hugely to their sought-after, unique character and charm. Whether a solid wood plank design, framed four-panel Victorian design, or 1930s style with upper lights, if your cottage still has its original door, then try wherever possible to preserve it rather than replace it. Find out more about maintaining period front doors in our guide. To enhance that quintessential, chocolate-box feel try framing your entrance with climbing plants such as wisteria or roses and adorn the steps with plenty of potted cottage garden favourites.